If you do not want to stop in the middle of the road and ask passing drivers for help because of a discharged car accumulator, a portable starter is exactly what you need. The main thing is to choose a good model. Let’s consider the characteristics of one of the best lithium ion jump starters of the current market. The kit consists of a starter, a cable with clamps, a charger, a USB cable, a carry bag and a user manual. This unit is nicely packaged with a decent carrying case although it doesn’t come with the computer, phone, tablet adapters that some of them do. This has 1000 peak amps which is really good. For those who aren’t familiar with this stuff, the 14000mah is the storage capacity of the battery but it is the peak amps that are actually going to turn the vehicle over and get it started. You can start most small cars with 500-600 peak amps. If you are going to start a large SUV or truck you will need considerably more. 1000 peak amps is sufficient enough to start most of your large V8 and Diesel engines even if they are completely dead. 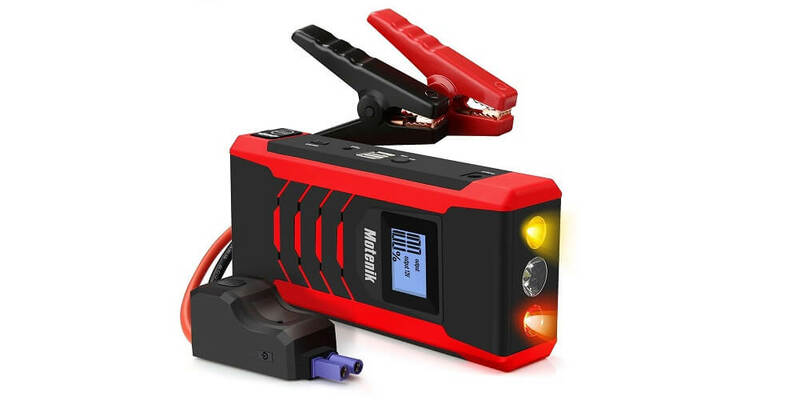 This universal device is able to return your lawnmower, yacht, motorcycle, car, snowmobile and some other types of equipment to working condition. If you like adventure, the presence of an alarm light should be attractive. Owing to it you will be perfectly prepared for extreme situations. Manufacturers combined more than 8 security technologies in intelligent clamps. They prevent short circuits, overheating, reverse polarity, overload, etc. Strict quality control is a guarantee of no fire or cracking. Thanks to 2 powerful USB ports you can charge several devices at the same time. 2 adapters in the case make charging on the road and at home extremely convenient and easy. The manufacturer provides high-quality customer service. The employees of technical support answer the questions within 24 hours. A guaranteed exchange is provided during the year. In the first 45 days you can return your money. Some users have noted that over time the charge does not reach 100% and gradually decreases. On the market there are counterfeits not corresponding to the quality level declared by the manufacturer. So you should pay special attention to the choice of the seller. In the network there is information that using a flashlight can reduce the charging speed. It’s hard enough to say something unambiguous about this device. Its advantages surely exceed the minor drawbacks. You should check the seller’s reputation and adhere to all the rules of exploitation. Then the starter will serve for a long time providing comfort in everyday life and safety in extreme situations.